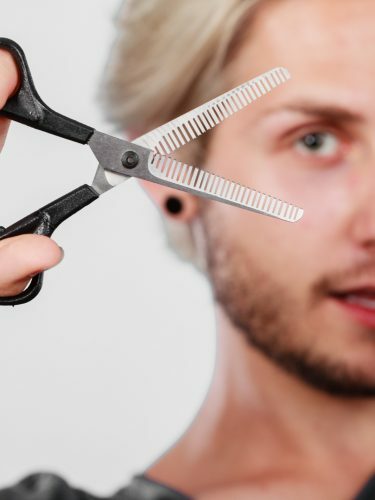 Do you know what the difference between a razor cut and scissor haircut is? Do you know that they look entirely different and can do different things to your hair? 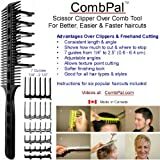 It’s important to know what all the different hair cutting tools are, what they’re used for and even how to use them. 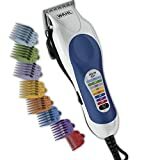 This knowledge can come in handy whether you like to DIY your haircuts, trim your husband’s neckline in between haircuts or even if you just want to have better communication with your hairstylist. 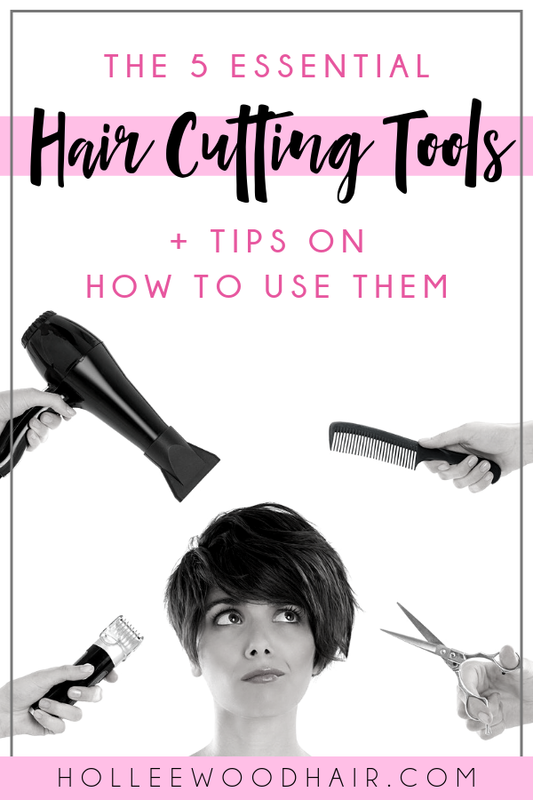 So… let’s talk about some of the most common hair cutting tools used in the hair industry. 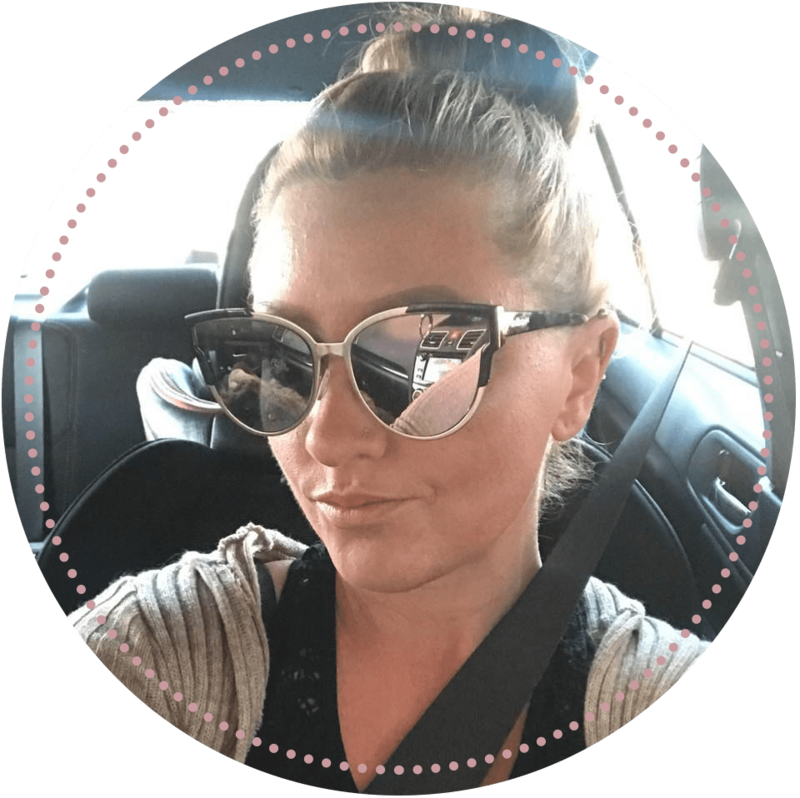 *This post contains affiliate links meaning that if you make a purchase using them, I earn a small commission, which helps support this blog at no additional cost to you. Keep in mind that I only link to quality products that I use myself and feel would be beneficial for my readers. Please read my full affiliate disclosure for more information. Shears are the most basic and commonly-used tools to cut hair… but they’re a lot more complex than your basic kitchen scissors. 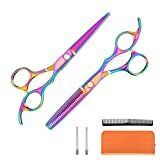 These scissors are explicitly designed to cut hair and fit perfectly into the hands of the stylists using them. They typically range between 5-7 inches and have a “tang” for the pinky finger to rest on (which gives the stylist more control). 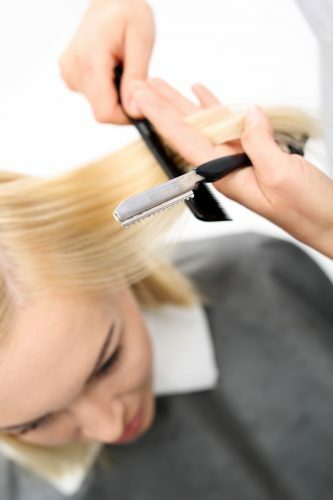 Newer-type shears have been ergonomically designed to put less stress on the stylist’s hand, arm, shoulder, and back. This helps help prevent carpal tunnel syndrome, tendonitis, and bursitis (oh my). Things like the shape of the shears, built-in swivels, and the spacing between finger holes all contribute to the overall design. The best part of hair cutting shears is that they’re crafted to slice right through without bending or folding the hair. In other words, they’re really sharp. In fact, they need to be sharpened every so often to stay in tip-top shape. You’ll want to use these types of shears to deliver a precision haircut or when the desired look is a blunt line. 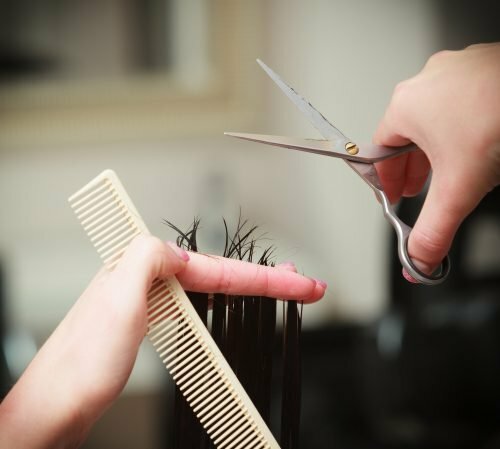 While scissors can cost upward of $1,000, you probably won’t need anything to that extent unless you’re a top-rated celebrity hairstylist. Kamisori is a leading brand of hair cutting shears, and the award-winning Diablo model is a top choice for professional hairstylists across the world. I actually have a set like this to keep at home, and they’re perfect. I promise that they’re a million times better than the shears you’ll find in the “hair accessories” section of Walmart. Thinning shears are similar to cutting shears except they have “teeth” notched out on one or both blades. This allows the stylist to either thin the hair, soften the lines or texturize the ends. They can also be used to create volume with the use of various cutting techniques. Oh… and we can’t forget that they also help tame and blend stubborn hair. The only gripe I have with the video is that you should not cut “below the bend” of the hair (as she does when taking out bulk). This will leave you with really short pieces that stand up, which you probably don’t want. To be completely honest, when I first started doing hair, I used some really cheap, crappy thinning shears that probably came with my beauty school kit. I always felt like they were something that wasn’t worth investing in. However, somewhere down the line, I inherited a way nicer pair and let me tell you… it was a world of difference. Joewell is an excellent mid-range brand with fabulous thinning shears. 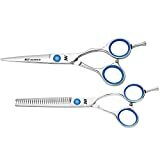 Like the cutting shears, you can find comparable thinning shears on Amazon for much lower prices. You can even purchase them in a set to save even more money. 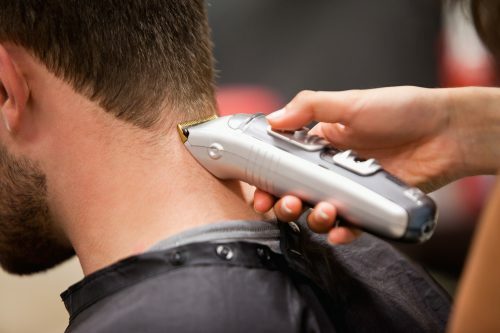 Did you know that you can literally cut hair with a razor blade? Razor cuts are the best way to deliver tons of texture and movement to an otherwise standard haircut. This is because razors don’t cut the hair in a straight line. In other words, they leave a jagged, textured style that doesn’t look like it was just cut. If you don’t like hard lines, I’d ask your stylist about this. A cool trick is first to cut the hair with scissors and then go back through and texturize the ends with a razor. 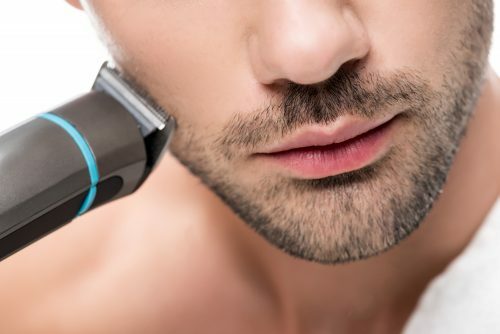 However, depending on the cutting technique used, a precise cut can still be achieved with a razor. In beauty school, I learned how to cut hair with a straight razor, but these days I’m quite fond of razor combs since they are much easier to control. I will say that you should be careful when using a razor to cut your own hair because they ‘re super sharp and can really mess up your hair. Also, this isn’t a good choice for curly hair, as it can really frizz it out the ends. This might be pretty basic knowledge to some, but clippers are used to create very short cuts such as fades and military haircuts. The way they work is similar to scissors but with two razor-sharp combs that move back and forth against each other to cut all hair that comes between them. An electric motor makes the blades oscillate from side to side. I think that Oster Classic 76’s are pretty much the best thing since the carpet sweeper! They’re expensive, but they deliver such a clean and precise cut. I couldn’t imagine using anything else. 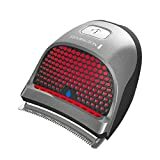 These little guys are basically designed to clean up edges on short haircuts, necklines, hairlines, and beards. They work exactly the same as clippers but are much smaller to really get in those tight spots. To take it a step further, extra small trimmers allow extreme precision and are typically used to carve intricate designs into the hair. The type of tool used to cut your hair determines the whole outcome of your haircut; knowing the difference between each instrument is vital. If you want a super precise haircut with blunt edges, you’ll want your hair cut with scissors. However, if you want texture, volume or jagged edges, go with a razor cut or have it texturized with thinning shears (both of which can also be used to take out bulk on thick hair). For super short haircuts, clippers are a must. Detachable blades deliver an even cleaner haircut and make it easier to fade. 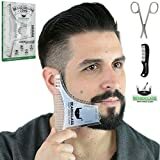 Trimmers are used to clean up the neckline, beard, and edges on short haircuts, or even to carve small masterpieces into short canvases. Thank for sharing. I often cut my hair at home and I have a Oster Classic 76′s.